Hamas leader Haniyeh says “March of Return” protests will continue until Jerusalem is liberated and the Gaza blockade ends. 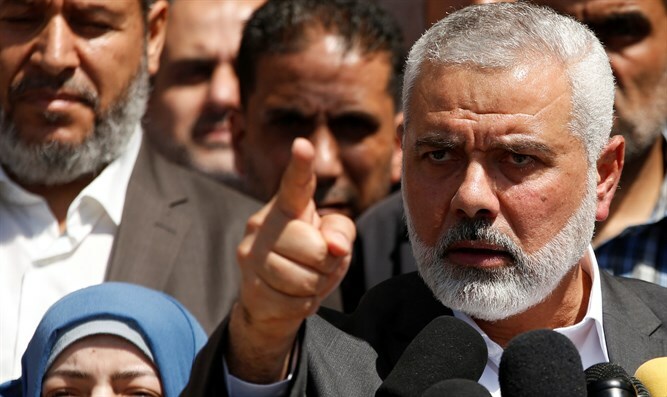 Hamas leader Ismail Haniyeh said on Thursday evening that the weekly “March of Return” protests in Gaza will “continue until Jerusalem is liberated and the Gaza blockade ends,” Yediot Aharonot reported. “The march must also expand into the West Bank and Jerusalem,” Haniyeh added. Since March 30, Arabs have held weekly violent riots in which they have hurled rocks, firebombs, and flaming tires at Israeli soldiers securing the border and have used makeshift “terror kites” to drop explosives on Israeli positions. The riots have been openly encouraged by Hamas as well as by Palestinian Authority (PA) chairman Mahmoud Abbas. 60 Gazans were killed in violent riots along the Gaza-Israel border on May 14, the day on which the U.S. relocated its embassy in Israel to Jerusalem. However, Hamas openly admitted that most of those killed were members of the group.